The Air Force has announced that an experimental spaceship that looks and acts like a miniature, unmanned space shuttle – riding the back of a rocket into space then returning to Earth to land in California – will launch for the first time this month. At a time when more countries – and particularly China – are exploring the military uses of space, the vehicle is the subject of speculation in the space community, with some wondering why the Pentagon rescued a program that NASA put on the chopping block due to a lack of funding in 2006. But the program is also drawing attention for what it might accomplish. With space enthusiasts and entrepreneurs constantly looking for ways to drive down the enormous costs of getting people or payloads into orbit, perhaps research by the deep-pocketed Defense Department can start to find solutions. If it is successful, the program would “be a good demonstrator for a commercial reusable orbital stage, so I'm hoping that something practical comes out of this program,” writes David Riseborough of the blog Earth Space Continuum. For its part, the Air Force has sought to quell conjecture that the X-37 might be some sort of orbiting Predator drone, dropping weapons from space. It says it needs the sort of craft NASA was developing: a way to bring science experiments and small payloads back to Earth safely without having to send humans into space to do it. “What it offers that we have seldom had is the ability to bring back payloads and experiments to examine how well the experiments performed on-orbit," Gary Payton, the undersecretary of the Air Force for space programs, told Space.com. This being the military, however, there are questions about whether that is the whole story. With the Air Force divulging few details about the craft or its mission, even defense experts are unsure about the program. Is this a protoype of what will become a fleet of Air Force spaceships or is it an end in itself? "From my perspective it's a little puzzling as to whether this is the beginning of a program or the end of one," Peter Wilson, an analyst at the RAND Corp., a defense consultancy in Washington, told the Associated Press. The X-37 is roughly one-fourth the size of the space shuttle and though it will return to Earth, it is not completely reusable, like the shuttle is. All the elements of the shuttle are recovered and reused. The X-37 will take off from Cape Canaveral in Florida atop an expendable Atlas V rocket. The date for the X-37 to make its automated landing at Vandenberg Air Force Base on the California coast was not announced. It can stay on orbit for three-quarters of a year. Air Force press materials suggested the mission is intended to put the vehicle through its paces but did not offer specifics. NASA will be watching to see what the Air Force has learned. 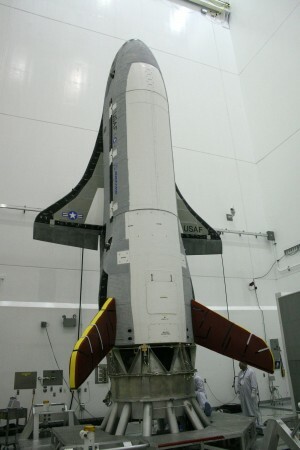 "We stay connected with the Air Force on the thermal protection system, [and] on the guidance, navigation and autonomous re-entry and landing," Daniel Dumbacher, the former X-37 project manager at NASA's Marshall Space Flight Center in Huntsville, Ala., told Space.com. "We stay in touch with them for data-sharing purposes, but that's the extent of it." CAPE CANAVERAL, Fla. — An unmanned Air Force space plane resembling a small space shuttle has been launched on its maiden voyage into orbit, carried aloft aboard an Atlas 5 rocket Thursday evening, the service announced. The rocket carrying the reusable X-37B Orbital Test Vehicle lifted off at 7:52 p.m. EDT from Cape Canaveral Air Force Station, an Air Force statement said. It called the launch of the winged spacecraft a success, but released no immediate details of the mission's progress. The space plane is to serve as a test platform for unspecified experiments and can stay in orbit for up to 270 days before gliding to an autonomous runway landing, the Air Force has said. The primary landing site is Vandenberg Air Force Base on the California coast northwest of Los Angeles. The mission length wasn't disclosed by the Air Force. The service has made public only a general description of the mission objectives: testing of guidance, navigation, control, thermal protection and autonomous operation in orbit, re-entry and landing. "This launch helps ensure that our warfighters will be provided the capabilities they need in the future," said Col. Andre Lovett, a launch official and vice commander of the Air Force's 45th Space Wing, in Thursday's statement. The launch culminated the project's long and expensive journey from NASA to the Pentagon's research and development arm and then on to the secretive Air Force Rapid Capabilities Office. Hundreds of millions of dollars have been spent on the X-37 program, but the current total hasn't been released. Unlike the shuttle, it was designed for launch like a satellite, housed in a fairing atop the expendable Atlas V rocket, and capable of deploying solar panels to provide electrical power in orbit. The Air Force launched a secretive space plane into orbit last night from Cape Canaveral, Florida. And they’re not sure when it’s returning to Earth. Perched atop an Atlas V rocket, the Air Force’s unmanned and reusable X-37B made its first flight after a decade in development shrouded in mystery; most of the mission goals remain unknown to the public. The Air Force has fended off statements calling the X-37B a space weapon, or a space-based drone to be used for spying or delivering weapons from orbit. In a conference call with reporters, deputy undersecretary for the Air Force for space programs Gary Payton, space programs did acknowledge much of the current mission is classified. But perhaps the most intriguing answer came when he was asked by a reporter wanting to cover the landing as to when the X-37B would be making its way back to the planet. “In all honesty, we don’t know when it’s coming back for sure,” Payton said. At only 29 feet long, the X-37B is roughly one fourth the size of the space shuttle. It’s onboard batteries and solar arrays (pictured at left from it’s NASA days) can keep it operating for up to nine months according to the Air Force. It is similar to the shuttle with payload doors exposing a cargo area, and uses a similar reentry procedure before gliding to a runway. In the case of the X-37B, the vehicle will autonomously return to earth and land itself using an onboard autopilot. The primary landing spot is Vandenberg Air Force Base in California. The military has been looking into the idea of an orbital space platform for decades. And the X-37 program itself has been around for quite a while. Built by Boeing’s Phantom Works division in the mid 1990s, it was first developed for NASA as a reusable space vehicle that could be carried to orbit either inside the space shuttle or using a booster rocket. The unmanned X-37 would then orbit for a period of time before launching or retrieving a payload and return to earth. A vehicle such as the X-37 could be a valuable platform for intelligence gathering with the advantage of a satellite’s point of view, but the flexibility of an aircraft that can be launched relatively quickly and maneuvered in orbit much easier than a traditional satellite. Mr. Payton, a former astronaut and senior NASA official, has acknowledged that the spacecraft is ultimately meant to give the United States new advantages on terrestrial battlefields, but denies that it represents any kind of space weaponization. On April 20, two days before the mission’s start, he told reporters that the spacecraft, if successful, would “push us in the vector of being able to react to war-fighter needs more quickly.” And, while offering no specifics, he added that its response to an “urgent war-fighter need” might even pre-empt the launching of other missions on expendable rockets. But he emphasized the spacecraft’s advantages as an orbiting laboratory, saying it could expose new technology to space for a long time and then “bring it back” for inspection. Mission control for the X-37B, Mr. Payton said, is located at the Air Force Space Command’s Third Space Experimentation Squadron, based at Schriever Air Force Base in Colorado Springs. He added that the Air Force was building another of the winged spaceships and hopes to launch it next year. 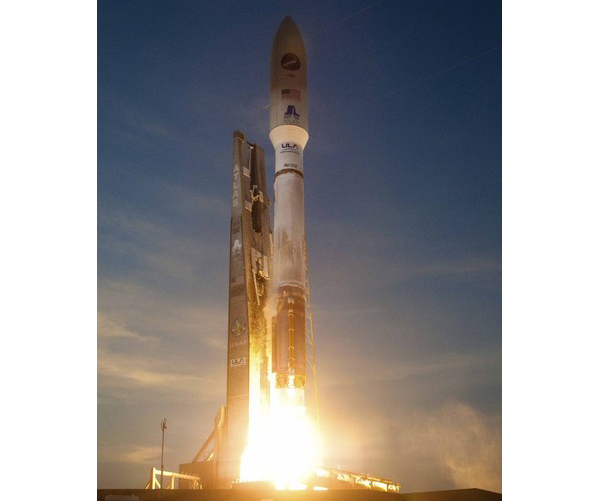 The current mission began on April 22, when an Atlas 5 rocket at the Cape Canaveral Air Force Station in Florida fired the 5.5-ton spacecraft into orbit. David C. Wright, a senior scientist at the Union of Concerned Scientists, a private group in Cambridge, Mass., said many aerospace experts questioned whether the mission benefits of the X-37B outweighed its costs and argued that expendable rockets could achieve similar results. 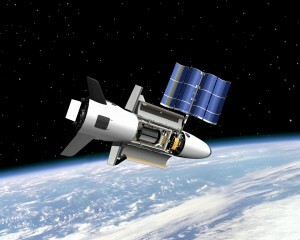 Mr. Weedon of the Secure World Foundation argued that the X-37B could prove valuable for quick reconnaissance missions. He said ground crews might rapidly reconfigure its payload — either optical or radar — and have it shot into space on short notice for battlefield surveillance, letting the sensors zoom in on specific conflicts beyond the reach of the nation’s fleet of regular spy satellites. But he questioned the current mission’s secrecy. He also questioned whether the Pentagon’s secrecy about the spacecraft’s orbit had any practical consequences other than keeping the public in the dark. The U.S. Air Force's robotic X-37B space plane came back to Earth Saturday after 15 months in orbit on a mystery mission, and its much-anticipated landing was caught on video. The X-37B spacecraft touched down at California's Vandenberg Air Force Base at 5:48 a.m. local time Saturday (8:48 a.m. EDT; 1248 GMT). Several hours later, Vandenberg officials released a short video of the event (seen above).